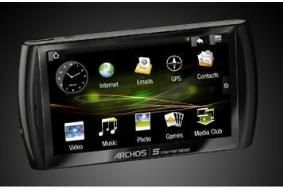 Archos announces Android Internet Tablet and reveals plans for Tablet Phone | What Hi-Fi? Keen to outdo the iPod Touch, the Archos has a larger 4.8in screen, higher 800 x 480 screen resolution and boasts a full-screen browsing experience that the company claims you won't need a zoom to read. Other feathers in this Internet Tablet's cap include support for Adobe Flash Video HD and Flash games, HD video output with 720p support, VOIP calls and 3D GPS for using the device as a SatNav. This jack-of-all-trades has more up its sleeve in terms of music thanks to a tie-in with Deezer that allows music streaming and the integrated Mewbox service that allows you to easily buy and share tunes on the Archos 5. You can also stream wirelessly from a PC. The Archos 5 will be available in 8, 32 and 64GB Flash-enabled incarnations, for £200, £276 and £370 respectively, while 160GB and 500GB hard drive models will set you back £300 and £350. Archos has also given a sneak preview of its Phone Tablet, again using the Android OS and again no doubt going up against a certain model from Apple. With no confirmed release date, initial specs suggest the unit would have 3.5G, a 4.3in touchscreen, 854 x 480 screen resolution and be just 10mm thin. Watch this space.